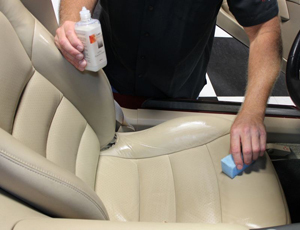 Powerful cleaning for high traffic leather seats. The Leather Master Strong Leather Care Kit combines the cleaning strength of Leather Master Leather Cleaner with the nourishing protection of Leather Master Leather Protection Cream. The result is a kit tough enough to remove stubborn soil but gentle enough to soften and restore leather seats. Use the Leather Master Strong Leather Care Kit on leather upholstery, motorcycle seats, and all high use leathers. Leather Master Car Interior Leather Cleaner takes out what daily use puts into automotive leather seats. This water-based cleaner removes soiling from leather upholstery without altering the look or feel of the leather. Leather Master Car Interior Leather Cleaner is the next level of cleaning power up from Soft Leather Cleaner. Leather Cleaner is excellent for regular cleaning of stubborn dirt and dust buildup on high use leathers, like those in cars, boats, airlines, and on motorcycles. Leather Master Protection Cream dries quickly and leaves a stain-resistant finish. Microfiber All Purpose Towels are spun from an 80/20 polyester/polyamide blend, producing a highly refined microfiber. The microscopic polyester/polyamide fibers are split with a unique process that creates a every soft, absorbent texture. Use these towels to buff away the products in this kit without leaving behind lint. The outer surface of the Cobra Microfiber Applicator Pad has all the qualities you’ve come to expect from the finest in microfiber technology. The gentle, yet strong fabric is wrapped snuggly around a plush, absorbent sponge. This innovative combination of materials causes wax, polish, dressings, and sealants to spread more evenly, resulting in maximum coverage while using less emulsion. This handy little brush helps make your job easy when cleaning leather or vinyl seats. Use it to work Leather Master Car Interior Leather Cleaner into the leather and break up stains. The Leather Master Strong Leather Care Kit takes the tough soil out of leather to leave it clean, soft, and supple - the way leather seats should be. Use this kit regularly to keep all high use leathers looking and feeling like new. A total retail value of $56.93. Save $11.94! For protected leather. Avoid aniline, nubuck or suede. Just used this kit in combination with the leather vital to clean and protect the leather seating in my 2007 Tundra. Used the included scrub brush together with the cleaner and the amount of dirt and oil pulled from the seats was very surprising. Also like the protectant because it didn't leave the seats shiny or overly slick. Seats are now back to the dull-natural looking leather finish they hadn't seen since new 5 years ago.